Sears CEO Eddie Lampert and board member Bruce Berkowitz just stepped up to buy even more shares of the troubled retailer. That doesn't necessarily mean they expect Sears' turnaround to succeed, though. Barely more than a week ago, Sears Holdings (NASDAQOTH:SHLDQ) officially notified investors as part of its annual report that it may not be able to continue indefinitely as a "going concern." Not surprisingly, this triggered a sharp decline in its stock price. Yet in the past week, Sears stock has more than bounced back. 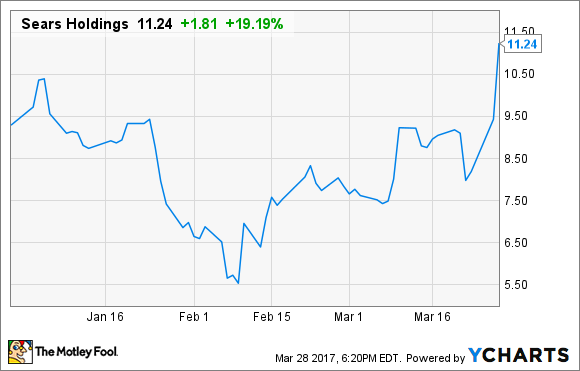 In fact, since bottoming out at $7.60 last week, Sears Holdings shares have rallied nearly 50%, including a massive 20% gain on Tuesday. This has sent them to their highest level of 2017. The recent rally in Sears stock was sparked by a spate of insider buying by Sears CEO Eddie Lampert and board member Bruce Berkowitz. However, investors shouldn't assume that it's safe to buy Sears stock just because these two hedge fund titans are doing so. In 2016, comp sales fell 7.4% and revenue plunged 12% year over year at Sears, leading to negative free cash flow of $1.5 billion. 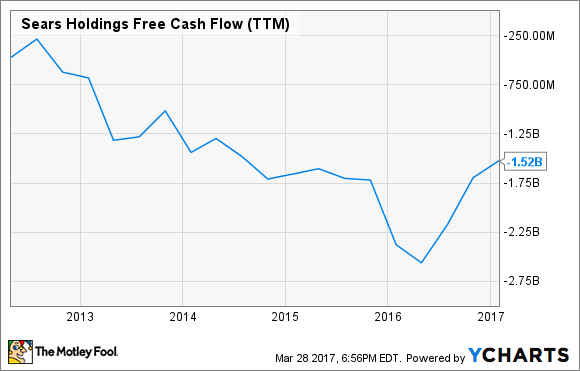 Indeed, Sears Holdings has been generating negative free cash flow of $1.5 billion or more annually for several years now. This is what forced the company to state in its recent annual report that it might not be able to stay in business. Thus far, management has resorted to a host of financial engineering tricks to keep the company out of bankruptcy. These efforts have included selling the rights to the popular Craftsman tool and lawn care brand and spinning off various non-core businesses like Lands' End. However, real estate has been the biggest source of cash. Most notably, Sears spun off Seritage Growth Properties (NYSE:SRG) as a REIT in 2015 and immediately executed a $2.7 billion sale-leaseback deal covering 266 properties. This deal is critical to understanding the recent volatility in Sears shares. Typically, when insiders buy company stock, other investors see it as a sign of confidence in the business. That's certainly the way investors seem to view the recent insider purchases of Sears stock by Eddie Lampert and Bruce Berkowitz. Together, the two investors (including their hedge funds ESL Investments and Fairholme Capital Management) have bought more than $10 million of Sears stock in the past week and a half and now own about 80% of Sears Holdings. However, this insider buying is more likely an attempt by Lampert and Berkowitz to prop up their broader financial interests related to Sears. Sears CEO Eddie Lampert has more money invested in the company's debt and shares of various affiliates than in Sears stock itself. Image source: Sears. The debt holdings give Lampert and Berkowitz a clear motivation to keep Sears operating as long as possible. Similarly, Seritage Growth Properties gets more than 60% of its base rent from Sears Holdings. So while Seritage's long-term strategy is to replace Sears throughout its portfolio with tenants who can pay higher rents, it would be in deep trouble if Sears suddenly went bankrupt and stopped paying rent. Eddie Lampert and Bruce Berkowitz may not be as bullish about Sears' future as their recent stock purchases would suggest. They probably hope that by solidifying their ownership of the company, they will at least be able to influence the timing of its seemingly inevitable demise. This is critically important to them, because they need Sears to repay (in full) the debt they hold and they need to give Seritage more time to diversify its tenant base. There is no credible plan for returning Sears Holdings to profitability, though. Its customer base is rapidly defecting and the company can't afford to make the investments that are needed to keep up with rivals. Sears bulls may have a few days or weeks of glory. But when the dust settles, it will be clear that the company is still heading for bankruptcy. Investors can avoid the carnage by steering clear of Sears stock.